Due to a decline in cognitive function, elderly people with dementia are at a much greater risk of abuse and neglect by their caregivers. Dementia causes a significant decline in thinking skills and memory, often severe enough to interfere with everyday tasks and activities. These deficits make dementia patients easy targets for various types of verbal, physical and sexual abuse. According to the Centers for Disease Control and Prevention (CDC), there are approximately five million Americans over the age of 65 who have some form of dementia. Currently, Alzheimer’s disease accounts for up to 80 percent of dementia cases in the elderly, and numbers are expected to grow in the future. The CDC estimates that over seven million people will have Alzheimer’s disease by 2030, and 16 million will have the condition by 2050. Although the severity of dementia symptoms can vary significantly between individuals, many mental functions including memory, reasoning and judgment, and the ability to focus and pay attention are commonly affected. In addition, communication and language skills and visual perception are affected in over 50 percent of patients. People with dementia often have problems with short-term memory necessary for performing simple daily tasks. Many forms of dementia are progressive, so symptoms begin slowly and gradually get worse. Alzheimer’s, the most common type of dementia, is a progressive disease with no known cure. In the early stages, memory loss is minimal, but in the late stages of the disease, people lose memory, communication and reasoning skills. Depending on health conditions, elderly patients with late-stage Alzheimer’s generally live an average of eight to 10 years. In the United States, Alzheimer’s disease is the sixth leading cause of death for elderly adults. Elderly adults with dementia experience higher rates of abuse and neglect because they are not able to communicate their mistreatment. As a result, many cases of dementia and Alzheimer’s abuse go unnoticed or unreported. According to statistics, more than 25 percent of abuse and neglect cases in nursing homes and long-term care facilities go unreported to staff, administrative officials or government agencies, despite federal and state laws and regulations that require it. A nursing home neglect attorney commonly sees cases of verbal, physical and sexual abuse and neglect that go unreported until concerned family members get involved. Memory loss makes elderly Alzheimer’s patients a frequent target of elder abuse and neglect. Many abused patients can’t remember the abuse after it happens because of problems with short-term memory. They may remember physical or emotional feelings associated with the abuse but have difficulty expressing them due to loss of communication skills. Unscrupulous and aggressive caregivers often exhibit abusive behaviors towards elderly dementia patients knowing they are not likely to remember it. Recent studies show that 60 percent of caregivers admit to being verbally abusive with elderly dementia patients, and about 10 percent of caregivers admit to some type of physical abuse. Emotional and Social Needs – The elderly patient is intentionally and repeatedly ignored and left alone without needed assistance or any social interaction. Basic Needs – A nursing home staff member or personal caregiver neglects to provide the patient with food, water, and a safe living environment. Personal Hygiene – Elderly patients do not receive help with hygiene needs including bathing, brushing their teeth or hair, cleaning, and laundry. 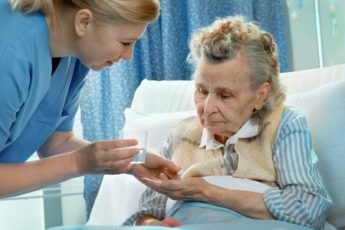 Medical Needs – The nursing home or caregiver fails to provide necessary medications and medical attention to health problems such as bruises and abrasions, infections, bed sores, cognitive diseases, illnesses, and mobility problems. Elder abuse and neglect by nursing home facilities and personal caregivers often result in serious injury and death for dementia patients. If the person dies as a result of intentional abuse or neglect, a wrongful death lawsuit can be filed by family members through a nursing home neglect attorney to recover damages for the deceased person’s medical expenses, funeral expenses, and pain and suffering. Family members with loved ones who have dementia or Alzheimer’s in nursing home facilities are urged to visit regularly and be on alerts for any signs of abuse and neglect, since many dementia patients can’t speak on their own behalf.